It really doesn't matter how good your spaceship is, where it is going or which great photos it took, if that information will not reach back to Earth, the entire effort will be in vain. One of the greatest things that NASA did, if not the biggest wonder, is the Deep Space Network (DSN) which celebrates its fiftieth birthday. 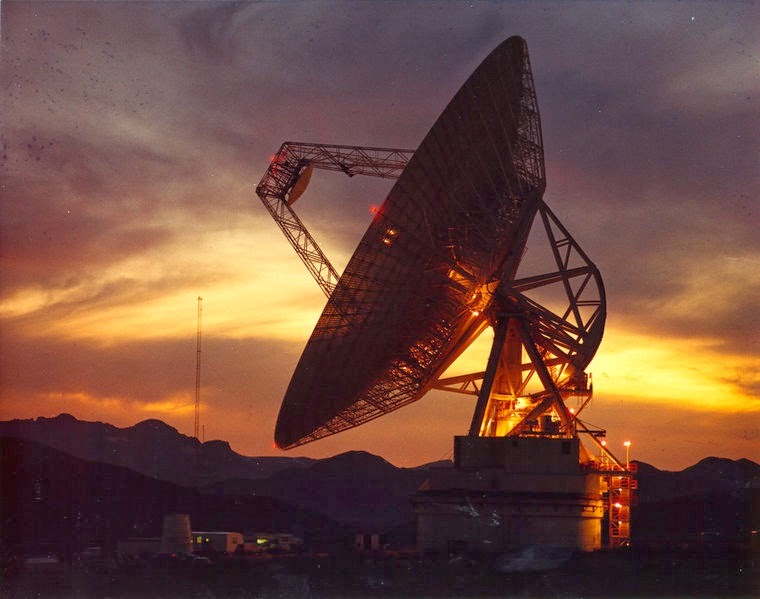 The DSN is a marvelous engineering piece of work supporting spacecrafts as old as fifty with all different kinds of communications methods, bandwidths and protocols. The network supports mission of close and extremely far from earth up to 19 Billion kilometers, as well as connecting with other networks which supports Low earth orbits satellites. The network is the heart of all NASA's operations and one of the most critical assets of the planetary research. The network has three bases spread over the entire globe. One center is in California, the second is in Spain and the third is in Australia. In those centers there are many dishes. The biggest ones are 70m in diameter and are used to receive the weak signals from Voyager 1 missions. It takes 18 hours to the signal to reach Earth. The download speed is awfully low, just 120 bits (yes bits, not Mbits) per second. In the beginning of Voyager mission and when it was closer to Earth the speed was much higher but the far distance and the need to conserve energy slowed it down. But Voyager is not the only mission in the solar system. There are dozens of other missions and all need their communication time-slots. Each mission has different protocol, bands, frequencies and the antennas must be pointed very accurately. Managing the operation is a 24 hours job and not an easy one. The network starts to work from a distance of 15000km from Earth. A spacecraft in this distance will always "see" at least one of the network's bases. The ISS and other satellites use different network system. The antenna are always working and although they need maintenance there is currently no plan to do it. Such activities will bring down its networking abilities for long time and will prevent the normal operations of the missions. Keeping the DSN up and running is a major challenge for NASA in the coming years. To celebrate the 50th birthday of the networks, NASA created a site -DSN Now- which will show you which antenna is "speaking" with which spaceship. I got addicted.